There was a popular movie out not too long ago with Sandra Bullock in it. Although she was an FBI agent, she was not beautiful. She was a bit disheveled; much like the piano was when I found it. She did go through a rapid transformation where all the beauticians reworked her overnight. She is transformed into a stunning beauty. This is the way of Hollywood-quick and almost unbelievable. Through the journey of the piano I learned that true beauty is found within. 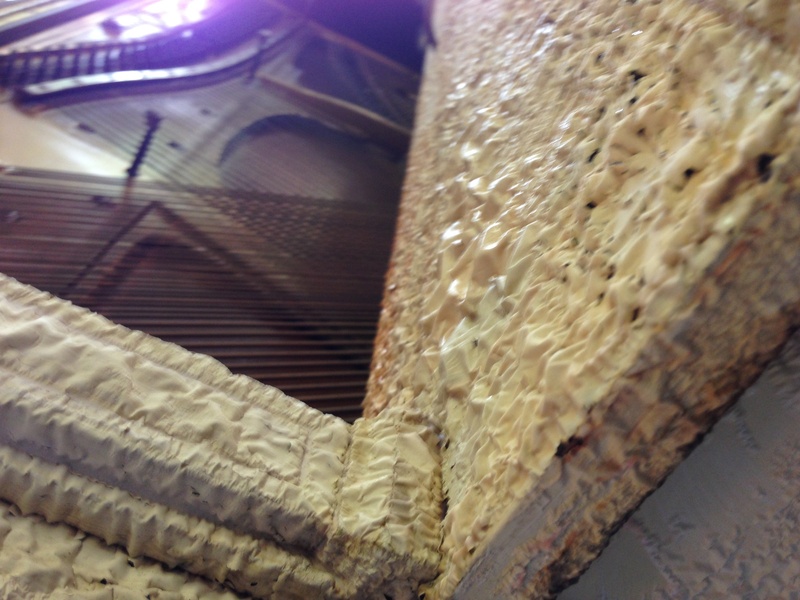 My piano had beauty under the surface, yet it was going to take some work to get there. This was going to take paint stripper, sandpaper and when necessary, yes, power tools would be used to bring out the beauty below. I don’t know about you, but I don’t think any of those things would make me fell warm and fuzzy in helping me find beauty. Yet, they were a part of the process of finding the beauty underneath all that had been collected through the years on the piano. We too need to go through a process of transformation. The good news is the power tools are not always required. He loves us and we love Him, He lovingly begins to rework us. Now that process can be gradual or a little quicker. It is rarely an overnight process. What Jesus is working out in us is not an outward beauty but an inner transformation, one that is motivated by His love for us and our love for Him. I don’t know about you, but if I know someone cares for me and has my best interest in mind, then I will do what they ask me to do. My dear child, don’t shrug off God’s discipline, but don’t be crushed by it either. It’s the child He loves that He disciplines; the child He embraces, He also corrects. At the time, discipline isn’t much fun. It always feels like it’s going against the grain. Later, of course, it pays off handsomely, for it’s the well trained who find themselves mature in their relationship with God. I don’t know if you have ever scraped yourself with sandpaper, I have, and trust me, it does not feel good. It hurts. Being transformed does not feel good. Sometimes, God brings people or situations that act as that sandpaper in our lives. This would be the people who rub you the wrong way. Then you are challenged to live in the attitudes of 1 Cor 13 (the love chapter when). Instead, you would rather bring out the “old man” by saying a few things that are on your mind. We can know that we have allowed God to work things out in us when the sandpaper comes, and we respond in a loving way without really thinking about it. Oh it doesn’t mean you don’t wish to say the things you used to. Through the Lord’s work on you, you have learned to take every thought captive and to use discretion in different situations. As God disciplines us, and teaches us He will also give us a boost through the process. 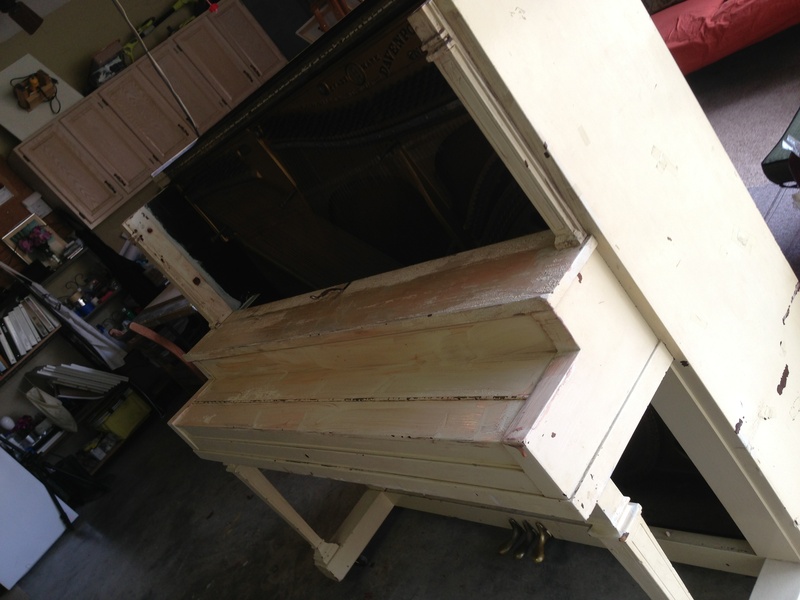 As I was in the process of sanding the piano one-day, I had a friend who was there to see how the progress was coming. We decided to pray and while we were praying, God began to light the spark in my heart that would reignite my dream. You see, the Lord reminded me that although I had given away the piano I had, He did not allow me to throw away my piano books. I had many, and when I was purging all my stuff before and after I moved, I did not feel right about about getting rid of them. Now I knew why, and I began weeping as we prayed. The flame was beginning to glow. We have taken the second step of finding the beauty within. I had to take the old off the piano before I could put the new back on. In the next part, I will share about taking off the old and putting on the new. May the Lord bless you as you follow this transformation. Beth Zinn – After losing her husband to cancer in 2011. She did the unthinkable. She moved across the country to a new state and took on the task of remodeling a foreclosure. Her heart reflects the journey of Ruth from the bible. Following the Lord and with the help of her young adult children and many other young adults. Her house is a beautiful reflection of God’s redemption. She has a great skill to see the beauty within the broken things of life. She is always working to find the beauty within the rubble and restore it to new. 25 Jul	This entry was published on July 25, 2013 at 10:47 pm. It’s filed under Thursday's Thoughts and tagged beauty through pain, devotionals for women, digging deep, encouragement for women, inner beauty, piano refinishing, Who Is Beautiful. Bookmark the permalink. Follow any comments here with the RSS feed for this post.